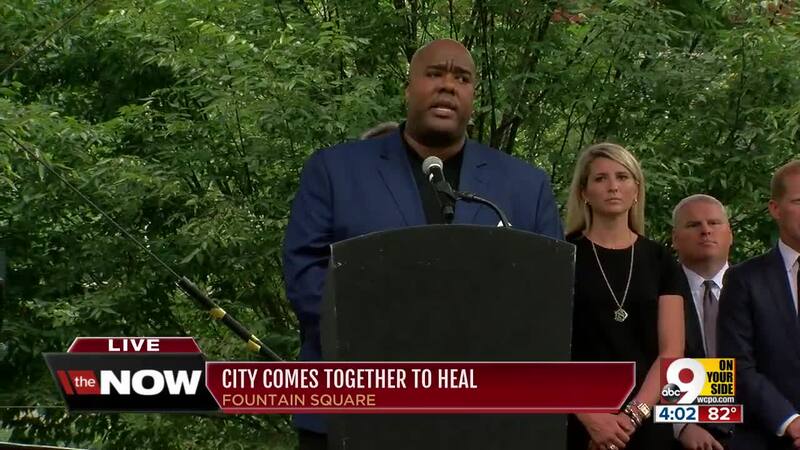 CINCINNATI -- Two pastors, the CEO of United Way of Greater Cincinnati and Mayor John Cranley addressed a somber, smarting vigil crowd in Fountain Square Friday afternoon, each attempting to salvage meaning and comfort from the chaos that had engulfed the city center a day before. "Thoughts and prayers" made an appearance. 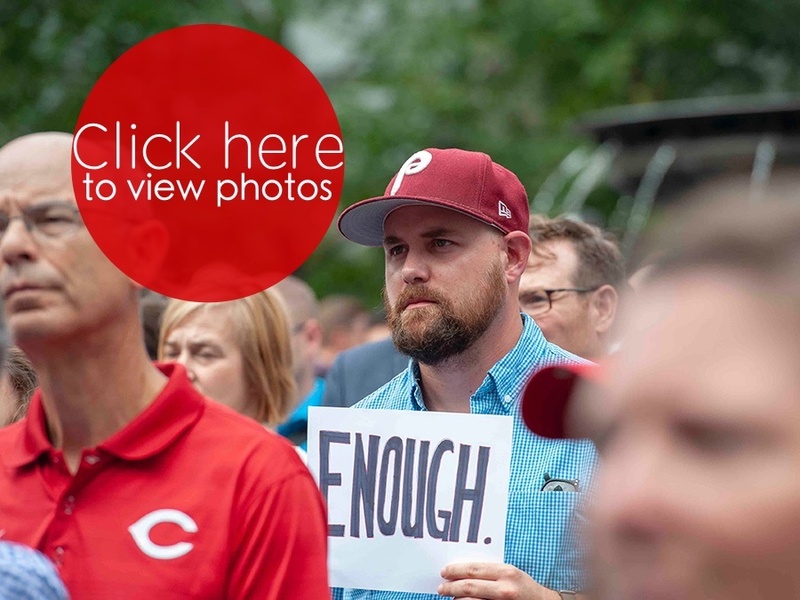 So, too, repeatedly, did the phrase "Cincinnati Strong," the hashtag of choice for those expressing support toward the victims of the Thursday morning shooting at Fifth Third Center and disbelief that such an event -- a gunman carrying over 200 rounds opening fire in the skyscraper's lobby, killing three people and wounding two -- could happen in one of Cincinnati's most-frequented public spaces. "It’s awful, it’s tragic, God doesn’t like it, and there is no answers,” Pastor Brian Tome of Crossroads. “It’s just the way it is. ... Do not try to stuff your grief. Do not try to have some Pollyanna spiritual phrase attached to it, and if you do have a Pollyanna spiritual phrase attached to it, please don’t tell me about it." Tome and Pastor Ennis Taite encouraged those who attended the vigil to inhabit the shock and anger they might feel in the aftermath of the shooting but remain mindful of their own good fortune compared to those who were injured, killed or robbed of a family member in the incident. Cranley discussed those victims, including the late 64-year-old Richard Newcomer and his widow, Cynthia Newcomer. According to Cranley, a short phone conversation with the latter painted a clear picture of the former, a 30-year veteran of the construction industry with a deep and abiding love of the city in which he lived. 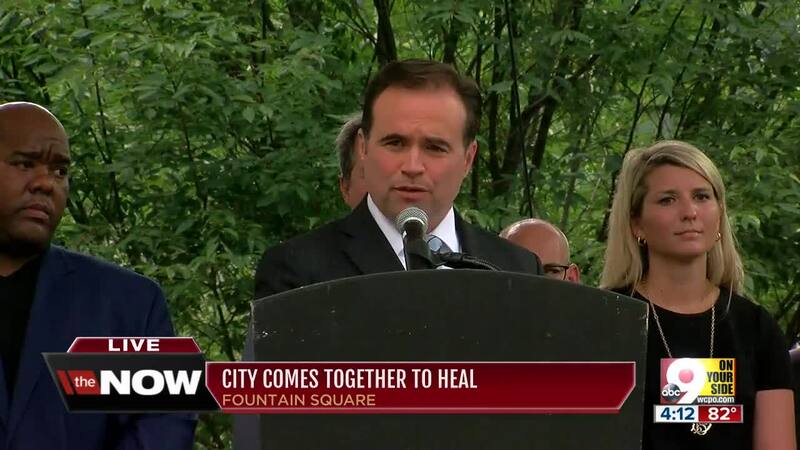 "She said, through tears, she was proud her husband built this city," Cranley said. "That he loved this city. That he loved the Bengals. 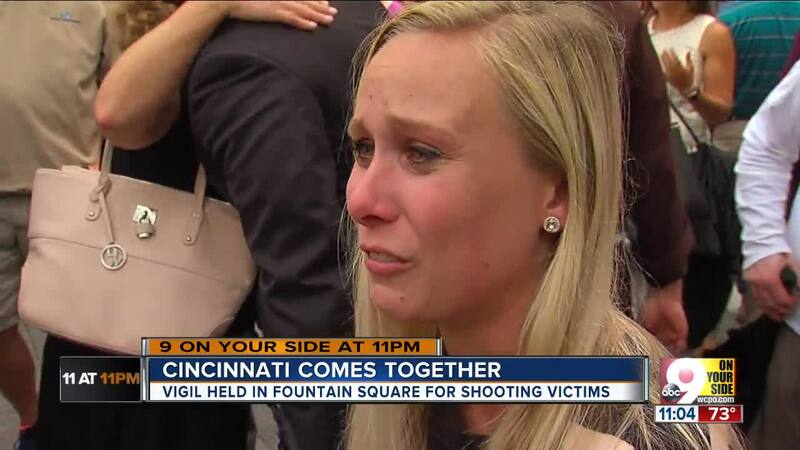 That he was Cincinnati." He also praised the efforts of first responders, many of whom arrived at the shooting scene within minutes of the first shots being fired. Armed police officers killed the gunman; security guards, EMTs and others helped comfort and treat bystanders whose Thursday morning had become a war zone. 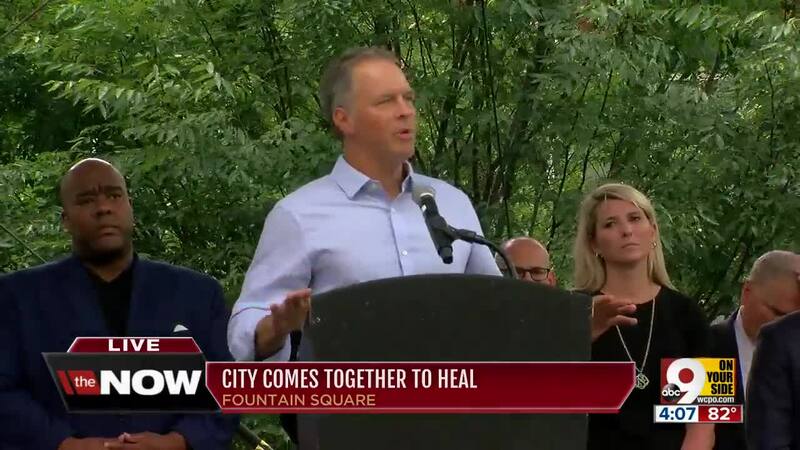 United Way CEO Michael Johnson had less to say but encouraged those attending the vigil to keep their hometown pride, empathy and love of other people in tact despite Thursday's shocking events. "Today, we want to start the healing process," he said. "I am hopeful that our community and our city will heal from this situation."